IronPigs pitcher Enyel De Los Santos has been named the International League Pitcher of the Week, as announced by league officials today. De Los Santos becomes the first IronPigs pitcher selected since Cole Irvin claimed his second award of 2018 on June 10. 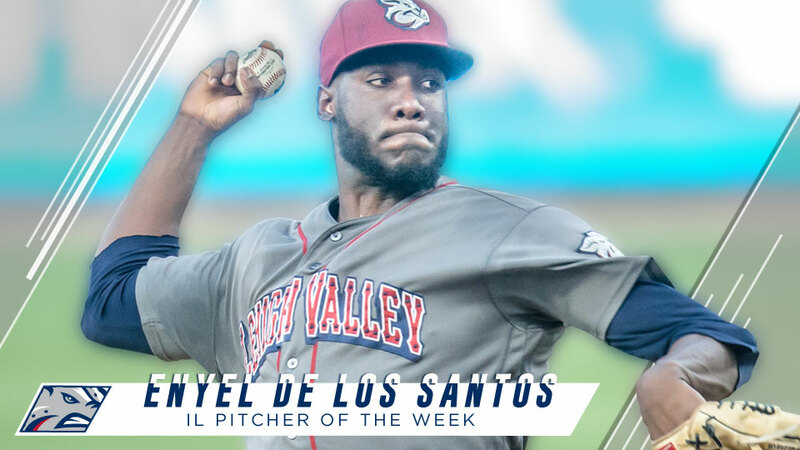 For the week of April 8-14, De Los Santos made one start, pitching seven innings and not allowing a single run while striking out nine batters on Friday, April 12 in Rochester against the Red Wings. The 23-year-old boasts a 2-0 record and a 0.75 ERA in his second season with the Pigs. He currently ranks 6th in the International League and 8th in all of Triple-A in ERA (0.75). He's tied for first in the International League in wins (2) and strikeouts (19). De Los Santos is 2nd in all of Triple-A baseball in strikeouts plus he's tied for fifth in the International League in innings pitched (12.0). While this performance didn't count toward his Pitcher of the Week honor, De Los Santos was STELLAR in his 2019 deubt, as well. All-time, there have been 16 other Pigs to receive this honor: Justin Lehr (2x: 4/19/09, 5/10/09), Nelson Figueroa (6/14/10), Brian Gordon (5/16/11), Tyler Cloyd (4/9/12), Scott Elarton (5/7/12), Adam Morgan (2x: 4/15/13, 8/7/16), Ethan Martin (7/1/13), Greg Smith (2x: 7/22/13, 4/20/14), Brad Lincoln (6/8/14), Jesse Biddle (7/19/15), Jerad Eickhoff (8/9/15), Zach Eflin (4/17/16), Ben Lively (2x: 6/12/16, 9/5/16), David Buchanan (7/24/16), Phil Klein (8/14/16) and Cole Irvin (2x: 5/14/18, 6/10/18).